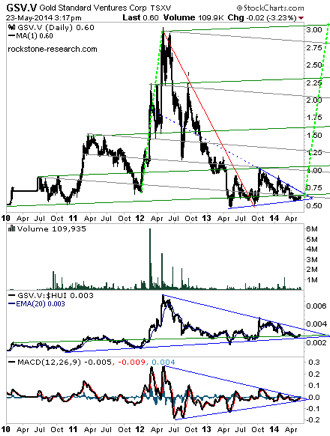 When we did our first interview with senior geologist David C. Mathewson of junior explorer Gold Standard Ventures Corp. (“GSV“) in February 2011, the stock traded at around C$0.80 and doubled thereafter within a few months. One year later, the stock traded at its all-time high around C$3 – thanks to sensational drill results from its North Bullion Deposit located in the northern part of its Railroad Property in the heart of the Carlin Trend in Nevada. The general gold price correction followed and forced the stock down to a new all-time low at C$0.50. When we did our second interview with David in October 2013, the stock traded at around C$0.70. Simultaneously, the Canadian investment bank Macquarie came to the conclusion that Railroad is “one of the few quality Tier 1 (+20 million ounce potential) drill hole plays in the market.” The stock appreciated strongly to the C$1 level, where after it came down hand in hand with a weakening gold price. Today, the stock trades at C$0.60 and with this report we initiate coverage on this C$65 million capitalized company – due to its attractive risk-reward ratio which has opened now, respectively after four years of intense exploration and land consolidation. Over the next weeks and months, we anticipate a strong and material news-flow on the recently acquired Pinion Deposit; thus we evaluate GSV as strongly undervalued for the time being. We expect our price target (C$2.80) to be reached within six months – irrespective of what the gold price may do. The fundamental reasons for this extraordinary prognosis are laid out briefly with this initiating coverage.